The table now has the first glaze of color. I will add more details later. As I move around the painting I have decided to add a very wet wash of Aureolin Yellow and Sap green to the leaves on the plant at the top of the painting. 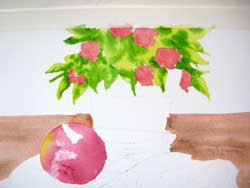 Again, for my underpainting I have used a wet-in-wet wash. The blending of colors gives a lime-green look to the leaves. I dropped in the Sap Green in areas where I wanted to create the soft illusion of shadows. Later I will add more detail to this, but for now I am happy with the wash. The painting is beginning to lose it's "flat" look. When painting realism, it's important to use the lights and shadows as a guide for how and where to apply the paint. I start out rather loose, then add details onto that foundation of color and value. Check back soon for another update on this painting!